I blame my local shop for this monster’s creation. Who runs out of Nutella on Pancake Day??? Seriously not even one lone jar to be lovingly taken home to my wonderful flatmates, who would make sure the Nutella was well and truly used. In fairness, it was Pancake Day and not the biggest shop but still -no Nutella! Now, this shows more my thought process than anything. I went from wanting Nutella to reaching for Double Stuff Oreos. In my mind, they would make up for the lack of chocolate joy in my pancakes. 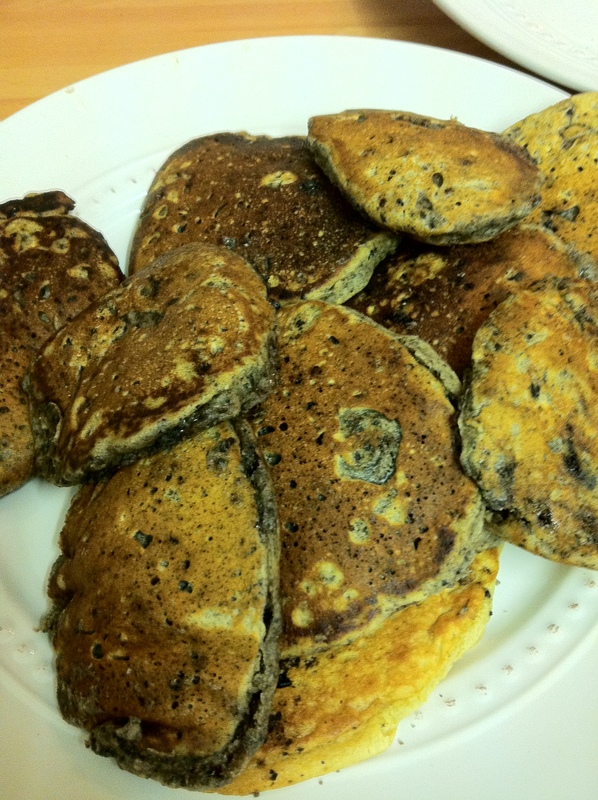 Also thought we could have a delicate crumb over the top and some baked into the pancakes for a change. After the first three, we went feral. 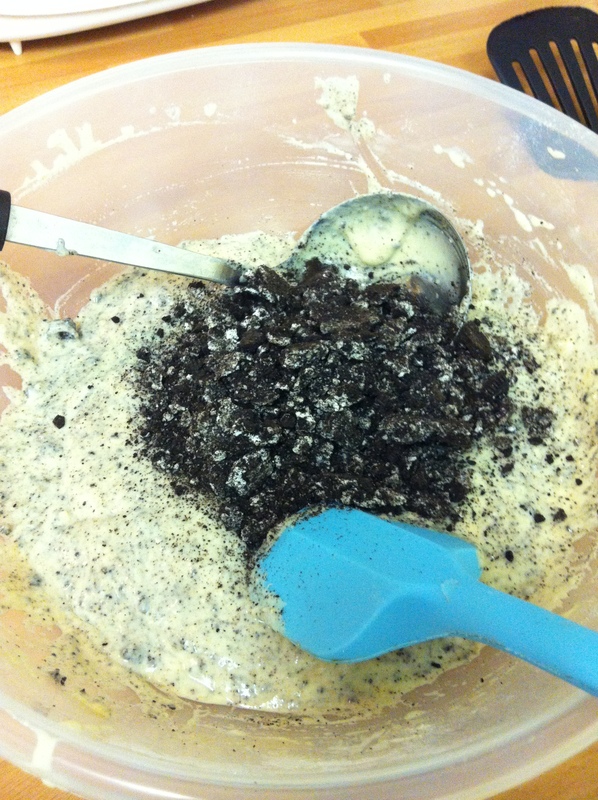 From using half a pack of the Oreos crumb to sprinkle, to a full pack and mixed into the batter. Dammmn. These aren’t the most pretty pancakes you’ll ever make, but these will make you very happy. The filling melts to a squidgy filling with crisp nuggets of cookie. Nom. Another secret is if I didn’t use them in baking, I would of happily of just sat down with an icy glass of milk and worked through the whole pack. Yum. You could top these with some ice cream but, to be honest, their so sweet as they are. 1 cup plus 8 tbsp Buttermilk or use whatever is in the fridge! In a bowl, sieve the dry ingredients and slowly whisk in the wet ingredients. 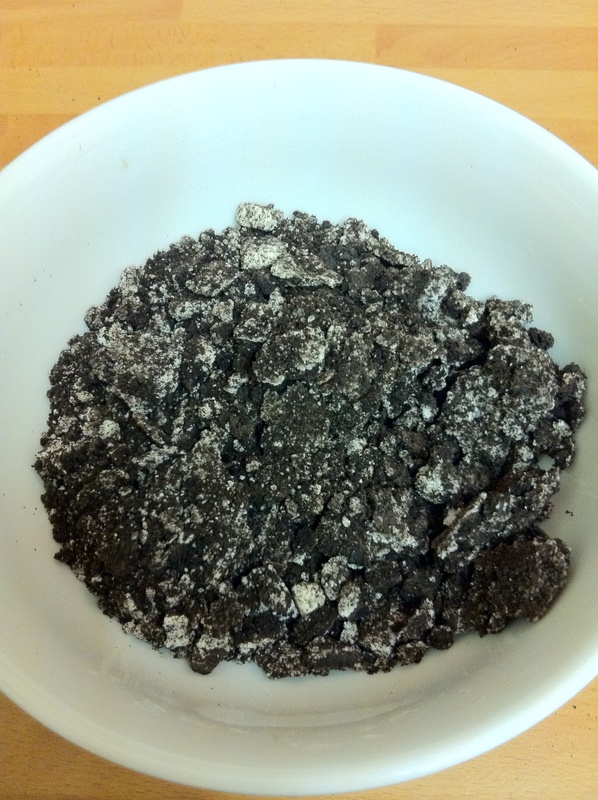 Fold in the crushed Oreos.That’s all – simple! Heat a large frying pan and add a little oil if not non-stick, ladle the mixture into the hot pan in 3 smallish blobs. They will puff up nicely, when you see the odd bubble form, flip them over, they should be nice and golden. They will only need another minute on the other side. Remove from the pan and place on a warm plate under the grill to keep warm while you finish the rest of the batter. 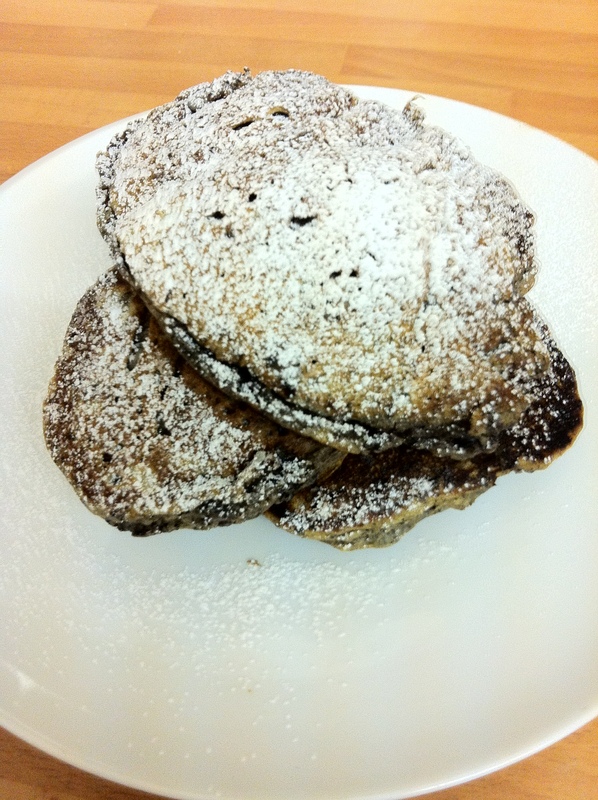 Serve the stack of pancakes with icing sugar. Thanks! Ooooo I haven’t thought of trying it out with other biscuits – maybe the golden crunch ones or bourbon, right we need to try all these out! Ginger biscuits for Christmas sounds perfect, but I can’t wait that long! There is always Sunday mornings! Oh wow… those look sinful! Yum! I found you on the hop and am your newest follower. I was kinda maybe sorta hopin’ that you’d pop on by my blog, stay a while, and follow me back! They sound fab, can’t wait to try them! Shut. Up. – Read that in a super American accent and you’ll understand the kind of reaction I’m having! 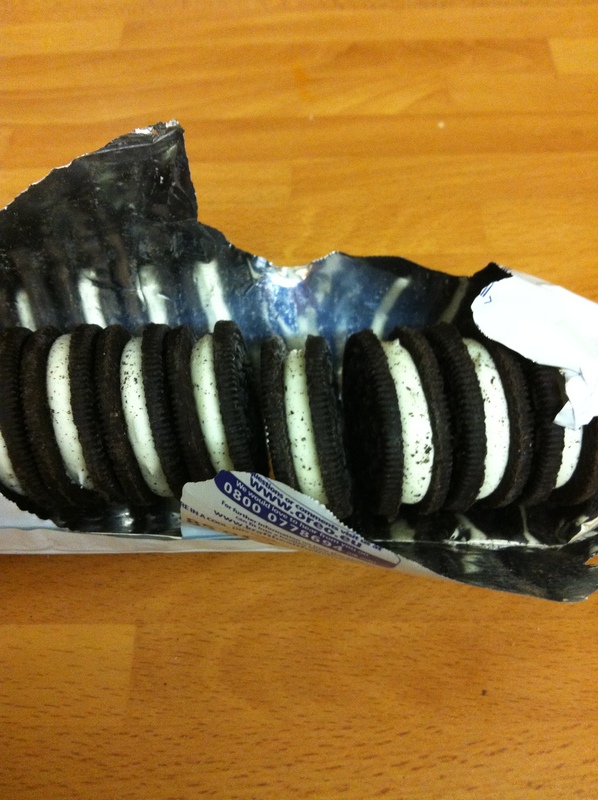 What a genius creation, is there anything Oreos can’t improve? Best comment ever. (Again you can do the ‘ever’ in a 90210 babe voice) The answer is nothing – there is nothing that adding Oreos in any form can’t improve. Including Mondays!